A dental implant is one of the possibilities open to us when we lose teeth. Historically, the most common type of replacement teeth was dentures. Over the centuries, the various substances comprising them included gold, wood, ox bones and even human teeth. The problems concerning exact fit and practicality became a constant quandary. It was not until later that alternatives became possible. Bridges and partial dentures continue to act as solutions. Yet, the naturalness and permanency of normal teeth remained elusive. While veneers could hide defective teeth, a positive solution to lost teeth was slow coming. Enter Professor Per-Ingvar Brånemark. In 1952, he discovered that titanium irreversibly binds to living tissue. This is osseointegration. In doing so, he created the basis for what was to become dental implants. Others took up his work and, in 1965, the first practical application took place. It was the beginning of a new era in dentistry and cosmetic dentistry. Implants are an in-office dental procedure. The dentist and or his/her team will surgically place metal posts into the jawbone. These act to replace the root of a tooth and anchor the replacement tooth. These are the key advantages to the process. The major drawback is the price tag. They cost more than dentures. Failures are relatively low. According to the The American Association of Oral and Maxillofacial Surgeons (AAOMS), the success rate of implants is 95%. This makes implants a positive choice for teeth replacement. When it comes to making the right choice for a replacement tooth, it is a solution worth consideration. Highly reliable and natural in appearance, they are ideal. There are few problems to worry about if the directions of the dental surgeon are followed closely. Does Insurance or a Dental Plan Pay for Implants? 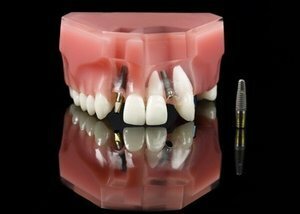 Where can I find an implant price list? Will I have any problems with implants? What's Your Story with Dental Implants? If you got dental implants, tell us your experience. Are you happy with them? Have they made your life better? Help others who are in the process of getting implants. What tips or insights would you give? Feel free to add your expertise in this area, too. You can include testimonials, pictures, or a video to showcase your skills and expertise. Your story will appear on a Web page exactly the way you enter it. You can wrap a word in square brackets to make it appear bold. For example my story would show as my story on the Web page containing your story. Add video (optional): Simply paste the public video embed code (Vimeo, YouTube, etc.) and we'll upload it behind the scenes. Do you have pictures or graphics to add? Great! Click the button and find the first one on your computer. Select it and click on the button to choose it.